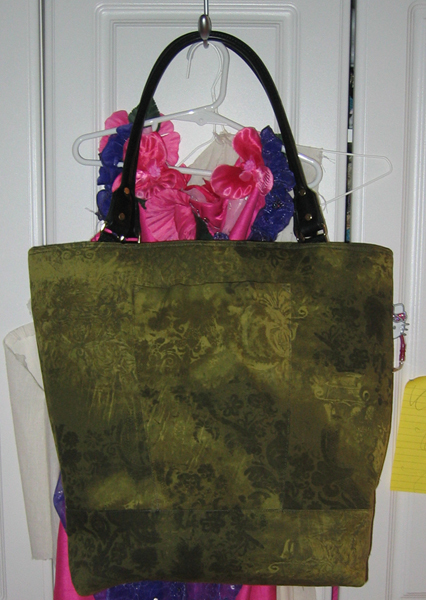 A large tote bag with customizable interior pockets. From the website: The Jitney Tote Bag is the perfect bag for your lifestyle and a woman’s frame. The flexible pattern lets you customize the array of pockets that fit your needs. Choose from these pockets: cell phone; sunglasses; organizer; umbrella and drink sleeves. It gives a lean line yet has a large capacity. It’s one size: 16 inches/41 cm tall x 12 inches/30 cm wide x 6 inches/15 cm deep. It’s considerably larger than any of my other totes. NONONO!!! They were often cryptic. I had to read many sections over and over, and some I could never every figure out what they were talking about. They started out with 6 poorly labeled cutting diagrams. 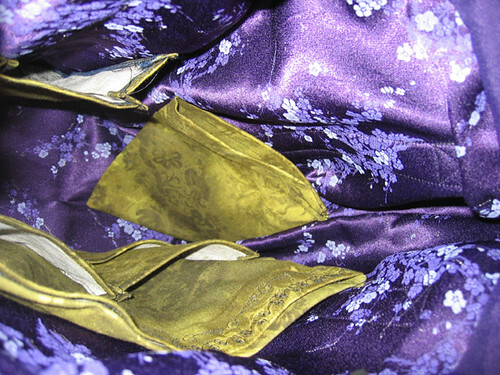 The pattern pieces were not marked with instructions like “Cut 1” or “Cut 2” or “Cut 1 on Fold”. You had to infer from the cutting diagrams how to cut each piece. They were marked Fold if they were supposed to be cut on the fold. The bottom of the bag is 2 layers. When attaching the outer layer to the main bag fabric, they have position the outer layer BEFORE finishing the edges of the outer layer. So you get it centered all nicely, then they tell you to fold under the seam allowance. 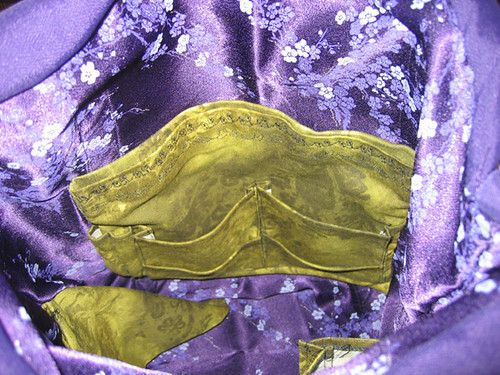 The outer pocket is trapezoidal in shape. They tell you to cut a rectangle, then fold under fabric to make a trapezoid. It would be MUCH easier to just cut the trapezoid shape. The pocket is folded in half so that the wrong side of the fabric doesn’t show, but they don’t have you seam the sides. 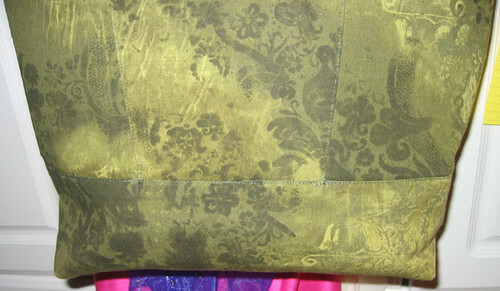 Instead, you sew thru all layers when attaching the pocket to the bag. 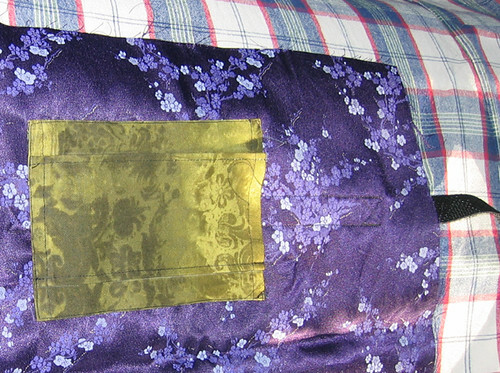 Oh, and it would be much easier sewing if the pocket is put on BEFORE the interfacing is attached to the main bag. I bought the jitney handles which are attached using webbing. For some reason, they have you buy 2.5 yards of webbing, sew it to the lining bag (granted leaving a space for a bag stiffener in the bottom), and then use it to attach the handles as the last step. I do not understand why so much webbing is required. You certainly don’t need it to attach the handles. The handles are attached to the webbing which is attached to the lining and outer bag fabric, so the bags are what are carrying the load (i.e. it doesn’t offer additional structural support to the bag). Sure the webbing didn’t cost very much, but it just seems very wasteful of time and an inefficient use of webbing. You could have done the same thing with less webbing, less marking, and less sewing. I was supposed to use a strip of vinyl (the instructions said 12 inches, the pattern piece said 12.25 inches) in the drink sleeve. I never figured out how; I suppose it doesn’t matter since I didn’ t have any. I found this section (for basically sewing a rectangular pocket) to be so confusing that I had to ignore it almost completely. I did use the recommended placement. OTOH, the cell phone / sunglasses pocket instructions were clear and easy to follow. I really liked the results, too. Alas, the trend did not continue. The organizer pocket instructions sucked. Again, they had you edge finish the pocket after ironing it into shape. Also, there was something in there about an invisible pocket and letting it hang free. I never figured that out either. The velcro’d pocket might be invisible to me in the dark without my glasses. However, I do like the results of the organizer pocket with utility pockets and business card pockets. You can put your wallet in the velcro pocket (but I’ll use a zipper next time) and have a big pocket behind it. Other than that, it was easy to sew. LIKE: I like the size. LIKE: I like the way they designed some of the interior pockets. LIKE: I like the overall look of the bag, including the outer pocket, contrast top, and extra bottom layer (could be contrast). DISLIKE: Did I mention that the instructions were just awful. Leftover stretch twill from fabric.com. Instead of “Fusible Bond (heavy weight)”, I used timtex. Timtex is very easy to sew, and it’s stiff enough to be selfsupporting. 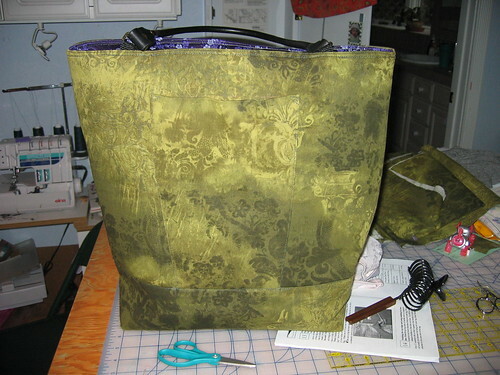 I used the main fabric instead vinyl for the bottom of the bag. I omitted the umbrella sleeve. They call for a separating outdoorwear style zipper. Why? It doesn’t need to be separating. I used a metal zipper. I might. I probably don’t have need for another bag like this, but it would make a good gift. It would make a great bag for an overnight trip or slumber party. I don’t think it would work so well for shopping. I loaded it up, and it gets very heavy. It would go under an airplane seat. It’s a very big bag with some nice pockets. Too bad the instructions are terrible.